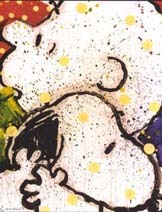 The work of artist Tom Everhart captures the many moods of Charles Schulz' immortal canine, Snoopy, and his ever-loving pals from the cartoon strip Peanuts. Everhart is the only person Schulz ever gave permission to reproduce the Peanuts characters in fine art paintings. And Everhart makes the most of it. His colorful abstract renditions make lively additions to home, den, or office. Inexpensive wall posters are featured. The Art-cade also a few original posters from the opening ceremonies of the Charles M. Schulz Museum and Research Center in Santa Rosa,CA in 2002. First come, first served.